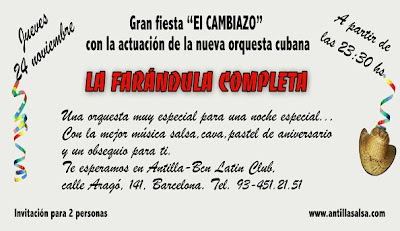 Yesterday was the big anniversary-party for Antilla, one of the salsa places in Barcelona. They celebrated 13 years at their current address, and every year around this date they have a big party. A gift, a free glass of cava, cake, and a fabulous live band, yes please!! The group sounded amazing, La Farandula completa. I haven't found any videos or even a homepage for this band but it is seriously one of the better salsa bands I have heard here. Back in Norway, we were lucky if once a year we could attend a salsa party with a live band, it only happens on a rare occasion up there, while here there are live bands playing at different salsa places every single week! (I guess we could see this in connection with the amount of people dancing salsa in Norway vs. Spain...) Anyhow it is brilliant to dance to live music and I feel privileged and very happy to be able to enjoy live salsa music this much! I am so happy today, not just because of the great night last night, but because this weekend, my dear friend Brad is coming to visit! For those who haven't been with me for that long, Brad from Australia was one of my flat mates in Málaga. Lucas from Poland was the other one. Lucas is back in Poland, but Brad is staying in Málaga this whole academic year and right now he's on the train on his way up here! Yay for live Salsa parties and for friends visiting! We just had a friend leave after staying with us for a week. I bet you'll have a fantastic time catching up! Der hadde vi visst ennå en ting felles.....jeg har dessverre nesten ikke danset siden vi flyttet ut av sentrum for noen år siden...savner det som bare det...da danset jeg salsa flere ganger i uken. Hvilken by bodde du i Norge? Ønsker meg snart et blogg innlegg om deg...er så glad i bloggen din...og blir alltid så glad når du ganske ofte er inne på min også...men...kjære deg...hvem er du? I would love to see that! Barcelona is one of the places I would really love to visit soon! am just a 'little' bit jealous. love salsa music and salsa dancing and wish i had cuba at my doorstep, so i could enjoy these incredible rhythms every day, every hour! @Marina, Barcelona is a fantastic city! !